NEED EQUIPMENT? WE HAVE YOU COVERED! The Township of Algonquin Highlands Parks, Recreation & Trails Department offers ski and snowshoe rental equipment at our Trails Office located at the Frost Centre Access Point (20130 Hwy 35). Please contact 705-766-9033 for information or to reserve equipment. Our Office is open 10am – 3pm daily, from November to March. Rentals are available daily and for multiple days. Daily rentals are based on the calendar day. A tw o day minimum charge applies to overnight rentals. 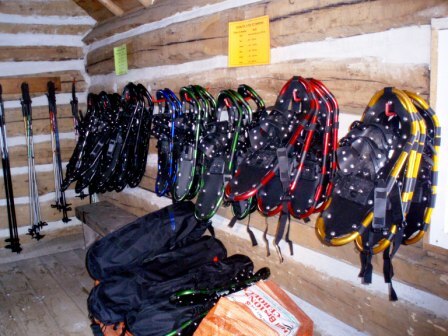 Rental rates include either skis/poles/boots or snowshoes (poles may be rented separately for snowshoe rentals). Rental equipment may be picked up by customers and transported to other access points within the Township of Algonquin Highlands. The Township of Algonquin Highlands Trails Department does NOT deliver or pickup equipment. Rental equipment is limited please inquire with our office regarding sizing and availability. We recommend reserving equipment in advance. Two and three day trail pass discounts available, Monday - Friday: If you rent a skis/poles/boots package on a weekday, a trail pass is included (trail passes not included on weekend rentals). *All taxes are extra. Prices are subject to change. A valid credit card number is required for all reservations. Every reservation must be paid in full at time of booking. A credit card imprint (Visa or Mastercard) will be taken on arrival and is required for all rentals as a security deposit. If no credit card is available, a $200 deposit (cash or debit) is required. Pickups and returns are within office/store hours. A cancellation fee of $10.00 per reserved ski or snowshoe package will apply per no show or cancelled reservation. Customers are responsible for any and all damages incurred beyond normal wear and tear. Damages will be noted at time of return and charged a minimum of $100 until full assessment is made. We reserve the right to refuse rental if we feel that you are not prepared to use our equipment safely. The Township of Algonquin Highlands Parks, Recreation & Trails Department offers canoe rental equipment from our Trails Office located at the Frost Centre Access Point, 12 km south of Dorset, at 20130 Hwy. 35, on Lake St. Nora. Please contact 705-766-9033 for information or to reserve equipment. Rentals are available daily or for multiple days. Daily rentals are based on the calendar day. A two day minimum charge applies to overnight rentals. Rentals include 2 PFDs, 2 paddles and a boat safety kit. Rentals are from/to the Trails Office. Rental equipment may be picked up by customers and transported to other Haliburton Highlands Water Trails (HHWT) area access points if properly secured to vehicle. The Trails Office does NOT deliver or pickup equipment. For large (20+) group rentals and deliveries, please contact Algonquin Outfitters at 1-800-469-4948. Paddles and 2 PFDs Incl. Boat Safety Kit (excludes flashlight - customer must provide own) Incl. A valid credit card number is required for all reservations. Every reservation must be paid in full at time of booking. A credit card imprint (Visa or Mastercard) will be taken on arrival and is required for all rentals as a security deposit. If no credit card is available, a $500 deposit (cash or debit) is required. A cancellation fee of $20.00 per boat will apply per no show or cancelled reservation. Customers are responsible for any and all damages incurred beyond normal wear and tear. Damages will be noted at time of return and charged a minimum of $100 until full assessment is made. Every customer must complete and sign a rental agreement and a waiver and release of liability form upon arrival, and by doing so acknowledges that the activities that are being participated in have inherent risk. The Township of Algonquin Highlands Trails Department assumes no responsibility for your safety or loss of personal equipment as a result of any rental agreement. It is the responsibility of the customer to know their limitations.